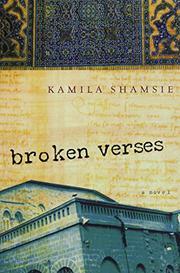 In a Karachi-set fourth novel, Shamsie (Kartography, 2003, etc.) explores universal themes. At age 30, Aasmaani Inqalab finds herself taking a job at a Pakistani TV station, where she meets Shehnaz Saeed, famed actress who is returning to the spotlight after years of retirement. Shehnaz also happened to be an old, close friend of Aasmaani’s mother. Aasmaani’s family tree is complicated. Her parents were married for less than a year, her activist mother was in love with a famous Pakistani poet, and Aasmaani was raised by four parents—mum, dad, stepmother and the Poet. But then the Poet died, and Aasmaani’s mother disappeared. And now, 14 years later, Shehnaz waltzes into Aasmaani’s life, bearing strange letters in some sort of code. She has received these letters from a nameless fan, and, remembering that Aasmaani’s mother and the Poet corresponded in code, she passes the notes to Aasmaani. Could these mysterious messages contain clues that would explain Aasmaani’s mother’s disappearance, or the Poet’s death? Aasmaani, who remembers the code from childhood, translates the letters and becomes convinced that the supposedly dead Poet is writing them. Thus the heart-pumping plotline. Has the Poet really been held captive these many years? And what happened to Aasmaani’s mother? But intrigue isn’t the only trick Shamsie has up her sleeve. This is also a story about parents and children, about Aasmaani trying to make peace with her strange childhood. It is a story about love, as Aasmaani and Shehnaz’s son find themselves drawn to each other. And there’s politics, to boot. The political backdrop—criticism of America, anxiety about the role of fundamentalists in Pakistani government—remains just that, a backdrop; it never overshadows, but rather somehow expands, the story. Aasmaani herself is this strong novel’s greatest strength. She’s a remarkable narrator, in a thoroughly captivating tale.